When I rode the Harley-Davidson Road King for the first time a few months ago, I really, really liked it. 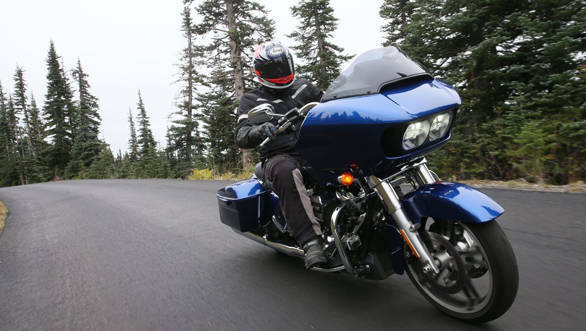 But move over Road King; the Road Glide has won me over. Of course, the Harley-Davidson Road King I rode was the 2016 model, powered by the older Twin Cam engine. This is the 2017 model powered by the all-new Milwaukee-Eight engine and features other updates as well. Harley-Davidson India has confirmed that the Road Glide will arrive in India as a CBU and expand the Touring line this year. But let us start with the engine. The Milwaukee-Eight is brand new. It replaces the Project Rushmore engines that powered the Touring line of Harley-Davidsons until the 2016 model year. The Rushmore was already a pretty advanced engine. It had ride-by-wire as well as partial liquid cooling etc. But given the international market focus for the company and the ever-tighter emissions requirements, Harley knew a new engine was needed. There were clear needs. The engine needed to look right so that the traditional Harley customers would feel at home. That meant a 45-degree V-twin configuration and at the very least the heavily finned appearance of the air-cooled engine. So, about 17 years after the Twin Cam 88 debuted, in comes the new Milwaukee-Eight. The top headlines on the new engine are the four-valve configuration per cylinder. The cylinders themselves aren't the usual semi-hemispherical chamber Harley has used so far. This time, the M8 uses a flatter profile. The rationale is manifold. First, the four-valve and twin-spark configuration offers more scope for tuning, for customers (less important) and for Harley-Davidson (very important for an engine family that will power many models for many years). The engine will also find it easier to meet and beat emissions norms without affecting power or longevity. The more modern combustion chamber also means that combustions happen faster which means less heat is transferred to the engine parts. This, in turn, points to better heat management. Harley makes a point to underline that the exhaust routing as well as the cat-con positioning are both re-done to make sure the M8 runs cooler than its predecessor in slow going from the riders' perspective. All of these changes also permit a higher compression which rises from 9.5:1 to 10.5:1. As we have pointed out earlier, rising compression offers both more performance and economy. The downside is not sensitivity to fuel quality but that becomes a serious concern at much higher compression rations. There are multiple variants of the M8 that will be used to power the full complement of touring models. The basic engine is the M8 107 (cubic inches) which displaces 1,750cc and claims to make 10 per cent more torque than the outgoing engine. With a 111.3mm stroke, versus a 100mm bore, this is a long-stroke engine. 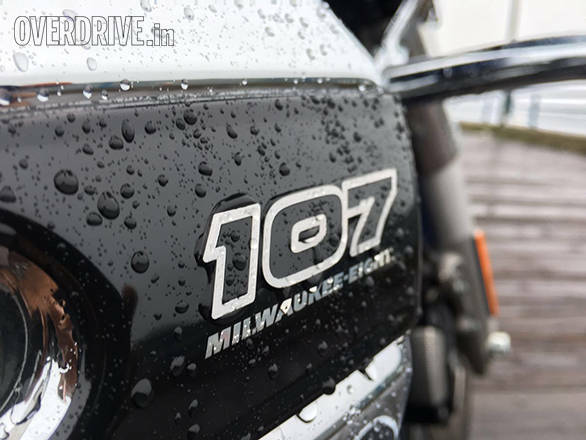 The M8 107 comes in Twin Cooled (oil cooling for the exhaust ports as debuted on the Rushmore engine) as well as fully oil-cooled configurations. The CVO models will get a more powerful 165Nm M8 114 (cubic inches) which displaces 1,868cc using a 2mm larger bore and a 1mm longer stroke. 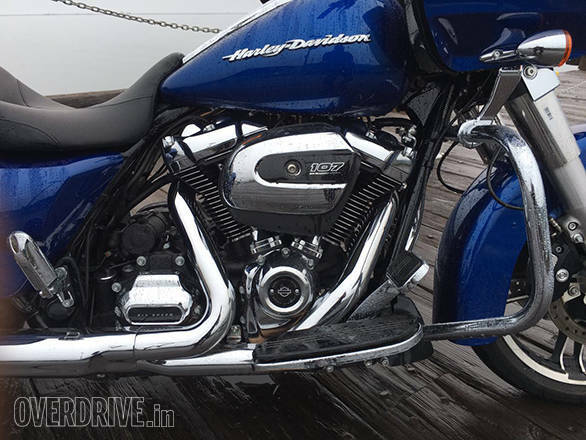 Both engines, says Harley, make more torque and offer more economy than the outgoing engines. The rubber-mounted engines also wear alternators twice as powerful for accessories and a counterbalanced set to 75 per cent. This means some vibration remains to keep the traditionalists happy. What else has been done? Harley quietened the mechanical noises to that the aural glory of the engine would remain within the bounds of noise norms. The crank is also different wearing weights further out from the rotational axis for greater inertia without any change in its weight. Also in the spec are stronger con-rods to handle the bigger stresses. And finally, it must look good. Harley uses a sharper set of cam cases up top and "shrink-wrap" the bottom to ensure that the engine looks like the mechanical, powerful thing it is. Next comes the software. Harley says it retuned the ride-by-wire system for the Milwaukee-Eight. The 55mm throttle body (up 5mm) now switches from matching throttle position to the throttle plate position and instead works out what torque is being demanded, which should improve rideability. Harley-Davidson also adds more sensitive knock sensors to stave off detonation -- the claim is to control detonation within two combustion cycles -- which means the engine can be run harder without risk, and made to produce more economy and torque. Other bits? A narrower air cleaner so that the rider can sit more comfortably and a slip and assist clutch to reduce lever effort. How does the Milwaukee-Eight feel on the move? Lovely, really. The 75 per cent counterbalancer is an interesting tactic because the motorcycle really does vibrate like you expect a Harley to at the bottom. The feelings are bolstered further by the fact that the idle is now lower, 850rpm, which has heat as well as vibration benefits. But this is a rubber-mounted engine. Which means that once the revs come up - redline is 5,500rpm - the Road Glide settles in to a smooth groove that really is fun. Peak power is just above 5,000rpm, but the motorcycle repeatedly reminds you ride at lower revs and high gear. To wit, a comfortable 100kmph cruise is just under 2,000rpm in top gear and it's very smooth. After miles and miles of riding, hands remain buzz-free and the sense of the endless lope-ability is literally oozing out of the motorcycle. Harley claims 10 per cent more torque from the 1,745cc Twin Cooled V-twin on the Road Glide than earlier, but to be honest it is hard to quantify the difference in an environment this familiar. That said, I managed to hit nearly 170kmph on an empty stretch of road, and the engine felt composed and reasonably unstressed. The only engine that felt even more together, perhaps, was the bigger 1,868cc Milwaukee-Eight on the CVO Limited that I also got a chance to ride. The Touring models also get all-new front and rear suspension. Harley says the new units cut harshness and improve control. The new forks are 49mm units that use "Showa dual bending valve forks". Translation, the forks use cartridge-type variable hole-size damping valves that allow control over low-speed suspension movement (that's slow compression of the suspension, not of the motorcycle. Like a wallow or a long, rounded bump in the road). The same set-up should also be able to handle a sharper bump (a faster suspension movement) without harshness. That's the promise of greater control. The term bending valve refers to how the suspension is able to vary the hole size in the damping mechanism. A washer is clamped from inside in the damping valve. The pressure of the damping fluid bends the washer to pass it and the bending is proportional to the damper speed which results in controlled damping. Harley also uses two damper piston sizes, using a 3.9-inch piston on the lower models but switching to 4.6 inches on the standard models to improve low-speed damping. The rear suspension's goal was simpler. Harley wanted to offer a wider preload adjustment range without needing any tools. So the air suspension has been eliminated. Instead, a single knob offers 23 turns of preload, a wider range than before. Again, larger damper pistons have been used to offer more control of low-speed damping. 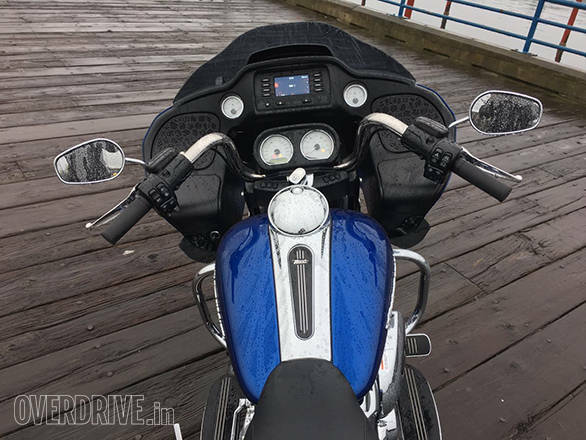 While Harley-Davidson clearly aimed to control wallow and behaviour over bumps that cause slow-speed suspension movements, the sense of the suspension's grasp of the real world is very strong. 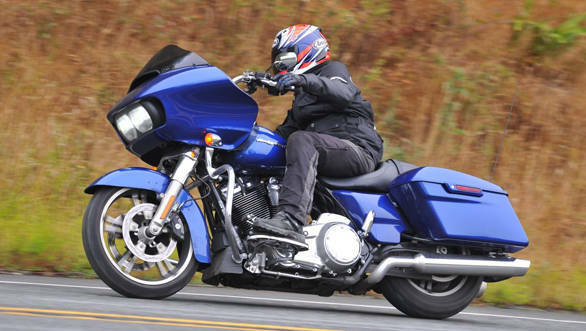 The Road Glide feels reasonably plush and ride quality is very good. However, there is still the matter of sharp bumps (high-speed suspension movements). The Rushmore bikes, in my opinion, made things a smidgen worse by becoming more road-friendly and transmitting more of sharp bumps to the rider. The new bike is definitely better in this regard, but it still likes to thwack past sharp bumps - something we will watch for when we road test the Road Glide in India post launch. You know, I've never understood the Batwing, as Harley likes to call the Road Glide's overwrought fairing. But now, I'm in love with it. Functionally, the Road Glide proved buffet free to almost 140kmph which makes it a good'un in my books - the Street Glide with the short screen cannot get within 25kmph of this for my height. But the surprise for me was the inside of the fairing which slopes forward and away from the rider. This creates a sense of space and, er, majesty that is quite unexpected. After two full days and nearly 300km of riding the Road Glide, I still was deeply engaged by that unique look and feel of the fairing. The 100km that I wasn't on the Road Glide, I found the look of the Batwing approaching in the mirrors equally engaging. 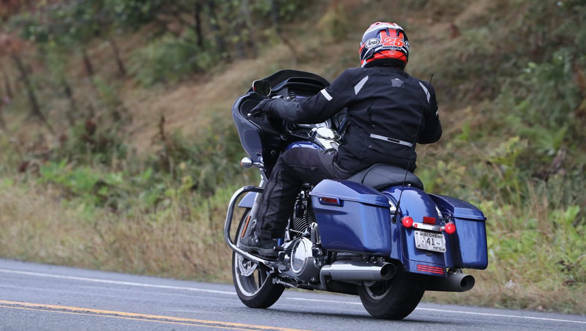 There is a sense of menace that comes from the forward slant of the fairing, and as surprised as I am in saying it, the Road Glide really is a rather interesting Touring Harley-Davidson. It's early days yet, says Harley-Davidson India to discuss price and bookings, but the Road Glide is expected this year in India. It will be a CBU and add to the Touring line. 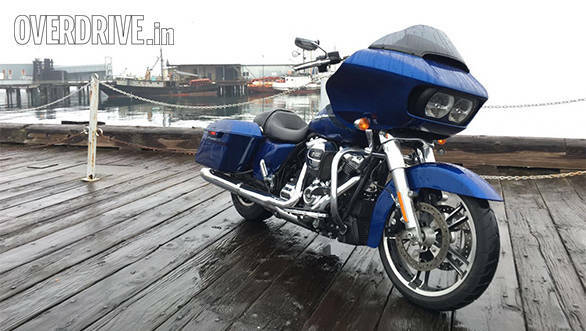 The Street Glide Special and the Road King are already in the India. So price? The Road Glide is more expensive than the Street Glide Special in the US, and by that standard I am expecting to see a price north of Rs 30 lakh for the Road Glide. I am frankly surprised by how much the fairing design and effectiveness affected my feelings about the Road Glide. The new engine is beautiful. It has great torque and sounds good, and it has a level of refinement that makes all-day highway work very easy indeed. Harley-Davidson has created a really good engine platform in the Milwaukee-Eight, and I suspect that this engine will show up on other motorcycle lines as well in time. 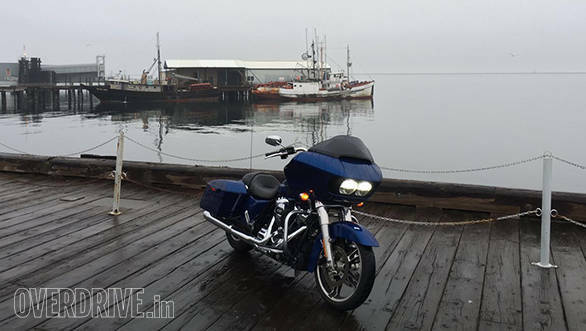 While we wait for that to happen, first, we wait for the Road Glide to come to India.